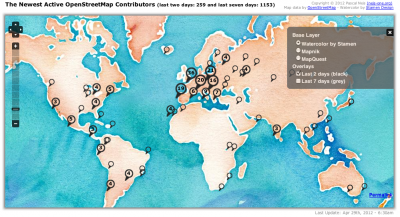 Where are the new OpenStreetMap Contributors? : Neis One! Where are the new OpenStreetMap Contributors? The visualized data will be updated on a daily basis. At the moment there are two layers available: one layer displays the latest members of the past two days, while the other layer does the same for the past seven days. At lower zoom-levels the icons are clustered and only show the number of new members. However, on higher zoom-levels you can click on the individual icons to get further information about the new project member. Thanks to Stamen for their really nice looking watercolor map. Would you like to see more statistics about the number of new contributors for each individual country? Is this based on where they edited their first node, and non-editing-users not displayed on the map? Do many new users set their ‘home location’ in their profile? I suspect not, otherwise it could be an alternative location to use. Gregory, as I mentioned in the post, it is based on one of their first node edits. Sure, if they did not make any edits yet, I am not able to display them on the map. Regarding your second question, as far as I know, it is not possible to access the users’ profiles to get their “home-location” information. Otherwise this would be an alternative for sure. * their user pages will then show the distance between the user’s home and their own. Anyway, that’s a very cool page, but I’m having a problem opening it in Safari. The browser reports the class OpenLayers.Layer.OSM.StamenWatercolor is undefined and I can’t find its definition anywhere looking at the code. There is an error in the script that prevents the page from loading in my browser. You don’t escape quotes, so there’s lines like “Taxi “Mirage”” in the code. thanks, it is great to monitor large areas for new mappers. One question please: How often do you update the map? thank you very much for your comment. The Map is updated daily. You can find the date in the bottom right corner. The new contributors RSS feed is awesome. Have you given any thought to how this could be integrated directly into OSM.org? I think it could be done in a lightweight way, that doesn’t impact the main OSM site significantly. * Add an edit page on OSM.org that allows user to select X number of areas to monitor. Store in DB. * Add some kind of geoJSON output for the contributors feed. * Develop a page on OSM.org that takes users stored monitor areas, makes series of json requests to neis-one (or perhaps another server hosted by osmf somehow), and returns listings of new users rendered as a list and as a map. Mikel, thank you very much! So far I did not think about integrating into osm.org. But you are right, overall it should not be much work. Overview maps are already avialable  and a table/list is online here . Hi, Pascal. This is a wonderful tool/site, especially to track user activity, and it is precise!! Can “How did you contribute to OpenStreetMap” also show gps traces uploaded by the user on that same page? thank you very much for your comment. Should be fixed.